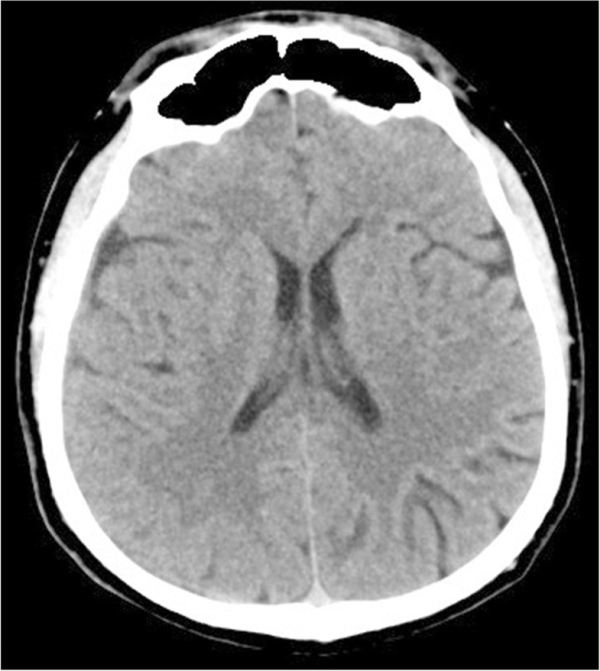 A 45-year-old man was admitted for a progressively worsening headache over 2 weeks. He denied history of recent head trauma or anticoagulation and antiplatelet medication. General and neurologic examinations were not remarkable on admission. Routine laboratory investigations including coagulation profiles and platelet function were within normal limits. Head computed tomography (CT) on admission revealed an isodense CSDH on the right hemisphere with mild midline shift. A CT angiography (CTA) was performed to rule out any intracranial vascular malformation. A DAVF was noticed at the transverse sinus with dilated cortical venous drainage. So, a digital subtraction angiography (DSA) of the external carotid artery and DAVF embolization was planned. No anomaly was noticed during selective angiography of the internal carotid and vertebral arteries and the left external carotid artery. 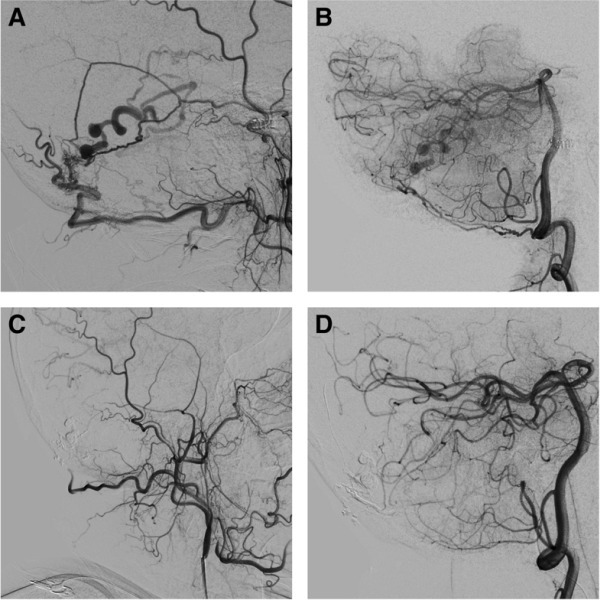 Selective angiography of the right external carotid artery showed that the DAVF was located at the transverse sinus and fed by posterior branch of the middle meningeal artery (MMA), the occipital artery, and the posterior meningeal artery and drained to the occipital cortical veins with venous ectasia. The DAVF was classified as type IV according to the Cognard classification. The embolization was performed via the MMA. The Headway duo catheter was used and accessed to the DAVF, and Onyx was injected until the shunt disappeared. The patient experienced an uneventful recovery. His CSDH gradually resolved in 1 month. No neurologic deficit was noticed. Isolated SDH is a rare complication of DAVF. In this report, we presented a rare case of CSDH secondary to an intracranial DAVF. According to this case report and our literature review, the so-called benign type of DAVF without cortical venous drainage does not always warrant a benign process and might be complicated with SDH. Careful preoperative investigation is needed for relative young patients presenting with idiopathic or atypical SDH.